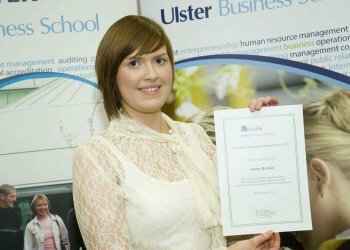 Overall winner Lynsey McClean, a BSc Hons Business with Marketing student at the Coleraine campus. Five student innovators were recognised for their outstanding achievements at the Ulster Business School’s 2010 Placement Innovation Competition Awards ceremony. The innovative projects ranged from developing new marketing strategies in the third sector to delivering technology solutions to improve management processes in the public sector. The overall prize went to Lynsey McClean, a BSc Hons Business with Marketing student at the Coleraine campus. Lynsey completed her placement in NIE Energy. During the placement year Lynsey observed that in the current economic environment consumer behaviour was changing and there was a desire for greater financial control of household expenses. Lynsey successfully capitalised on this trend to promote the Pay-As-You-Go Keypad meter in a well targeted marketing campaign delivered in partnership with the Post Office. Speaking at the awards ceremony, Professor Marie McHugh, Dean of the Ulster Business School said: “Despite the challenging environment that the business community and the public sector are facing, we are delighted that 300 students across the School are currently benefiting from a one-year placement.